How you style your hair is one of the most important aspects of your overall look and style on your wedding day. Whether your hair is natural or relaxed and no matter what length it is, there are plenty of options to make the most of your locks on your special day. If your hair is short, consider going for a sleek, relaxed look that will lay smoothly against your head. This allows you to wear any number of different headpieces or veils without competing for attention with your hair. Deep condition your hair for extra moisture, then use a flat iron so it lays smoothly against your head. If your wear your hair naturally in a large or long afro, consider gently pulling the front portion back from your face for the big day. Anchor it with a headband, combs or a tiara. Pulling your hair back slightly will frame your face better and help keep it looking great all day. If you wear your natural hair very short, consider accenting it with a tiara and veil combination. The folds of veil fabric will frame your face and add softness, while the tiara helps give your look some texture. If you have short, relaxed hair, consider giving it a little volume by curling it at the roots to lift it up from your scalp. Adding a hint of color to your locks can add individual style without having to resort to extensions or veils. A twist out is a fun way to add volume and curls to either natural or relaxed hair. 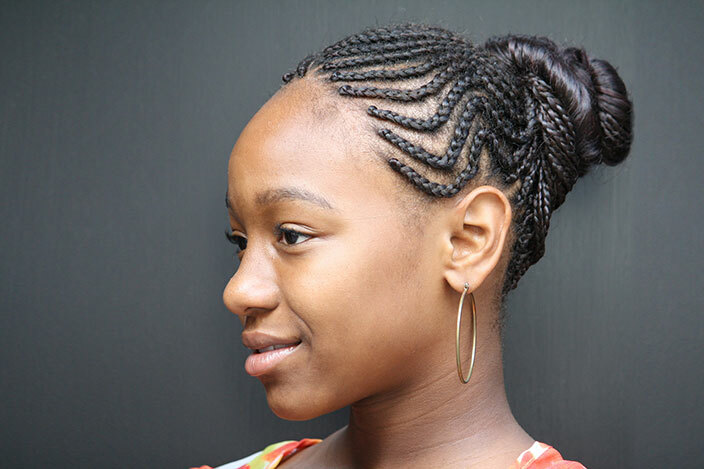 Wear your hair in twists for several days to weeks before the wedding, then release them on the day of. Shape the curls with a little defining cream to get volume and shine. If your hair is chin to shoulder length, consider wearing it loose around your face with some soft curls added. After deep conditioning and drying your hair, use a straightening iron to get an even texture, then curl it with a large barrel curling iron for soft curls. If your hair is long, you can use the same styling technique to achieve soft, spiraling curls that cascade over your shoulders. If you have shorter hair, but want the glamour of long locks for the day, consider opting for extensions and curling them the same way. Long braids, with or without extensions, can work well as a bridal hairstyle. Just smooth them down evenly on the sides of the head before gathering them in the back or side. A hair band or clip that follows the curve of the braids can be a great accessory. If your hair is long enough, consider getting an updo for an elegant look. Blow out and straighten natural hair, then curl the ends slightly before separating into sections and pinning into place. If your hair is shorter, but you still want the elegance of an updo, consider getting extensions or using a hair piece. A tiara or veil can separate the natural section of your hair from the faux piece so the contrast isn't as noticeable. If you have longer hair, consider pulling the front section back and up, while leaving the rest of it down. This style works well if you'll be wearing a veil or another hairpiece that can be anchored behind the front, pinned section. From short and natural to long and upswept, there are numerous ways you can wear you hair at your wedding. Find the right style for you to feel beautiful on your wedding day.